File photo: Reuters journalists Wa Lone and Kyaw Soe Oo. 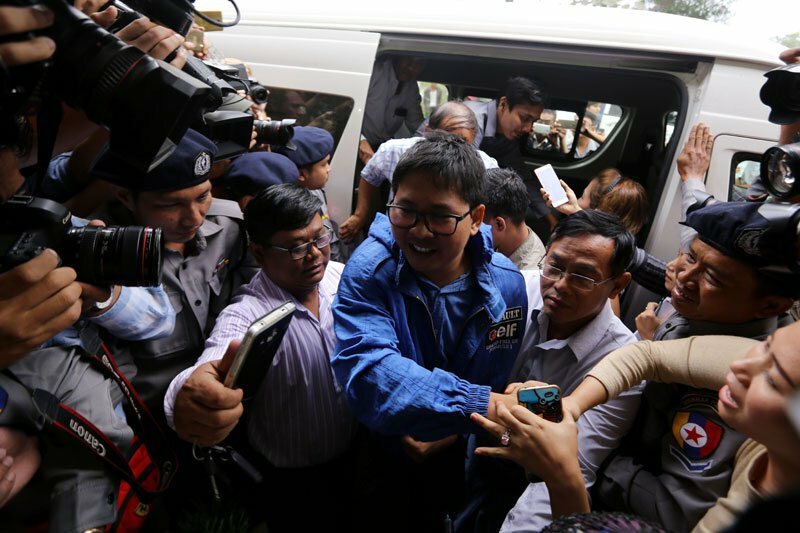 Two Reuters journalists were remanded in custody for another fortnight by a Myanmar court on Wednesday, following their first public appearance since being arrested under a secrecy law that carries up to 14 years in jail, Mizzima News reports quoting AFP. Wa Lone, 31, and Kyaw Soe Oo, 27 — Myanmar nationals who had been reporting for the global news agency on a military-led crackdown on Rohingya Muslims — were arrested after being invited to meet police for dinner on the outskirts of Yangon. They are yet to be charged by a court. But they are facing proceedings under the draconian colonial-era Official Secrets Act for allegedly possessing documents related to the army crackdown in Rakhine state — a highly sensitive issue in Myanmar. Myanmar officials have refused to comment on where the Reuters journalists were being detained or when they would be released. On Wednesday, the pair appeared in public for the first time in a court on the outskirts of Yangon, where they were embraced by tearful relatives who have been denied any contact with the two men. “They have not mistreated me,” Wa Lone told AFP inside the courthouse. The other reporter, Kyaw Soe Oo, urged other journalists to be cautious. “Please tell journalist friends to be careful. It’s really scary. We didn’t do anything wrong,” he said after an emotional reunion with his sister. Two police officers were also arrested over the case but were not present at the court on Wednesday. Reuters has denied any wrong-doing on behalf of their reporters, defending their right to report on an issue of global significance. The journalists’ arrests have deepened global alarm over vanishing press freedom in Myanmar, which is still shedding a 50-year legacy of junta rule. The emerging democracy is now led by former activist Aung San Suu Kyi, who was swept into office in 2015 elections that were a euphoric moment for a nation brutalised by decades of military rule. A slew of legal cases against journalists have compounded disappointment among those hoping Suu Kyi would usher in a new era of freedom. But her civilian administration must still share power with an army that retains firm control of security policy and other key levers of government. Suu Kyi’s time in office has also been dominated by the Rohingya crisis, with criticism pouring in from around the globe over her refusal to denounce the army’s crackdown and allow in international investigators. “These journalists were arrested while they were doing their jobs,” Than Zaw Aung, a lawyer for the Reuters journalists, said outside the court house. “It’s likely to shut down the voices of accused as they are being held for long time… We are worried about that,” he added. At least 11 journalists have been arrested in Myanmar in 2017, including two foreign reporters and a local journalist working for Turkish state broadcaster TRT. The trio were sentenced to two months in prison alongside their driver for flying a drone close to Myanmar’s parliament building in October.